Thank you! Your samples should arrive in 3-5 business days! Vermont Danby marble quarry has been in operation since 1767. Marble from the Vermont Danby quarry has been used in projects all over the United States and the world including the Jefferson Memorial and United States Capital. The Vermont Marble has a slight crystallization that makes it harder and more durable than most other marbles from regions like Italy. Royal Danby is similar in look to the Imperial Danby. However, it typically has less gold veining throughout the slab, and more of the dark gray or black veining. It is a beautiful option if you are looking for a stone with more contrast than Imperial Danby. The background of the slab is very white. Thank you! Your sample should arrive in 3-5 business days! 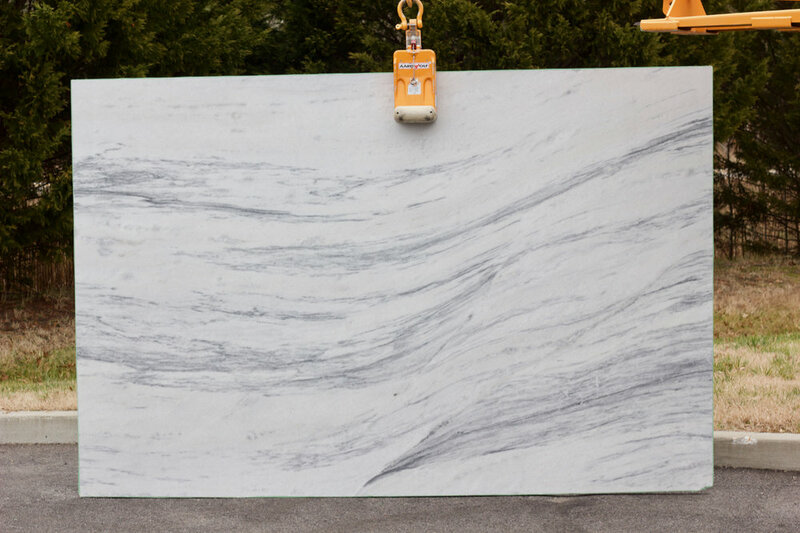 Imperial Danby is the most popular variety of marble from the Vermont Danby Quarry. Imperial Danby has subtle soft gold veins that run throughout the slabs. The slabs often also have light gray or black veins that move throughout the slabs. Since every block and slab is unique, the slabs can change significantly from piece to piece. Montclair Danby is one of the more exotic and stunning marbles from the Vermont Danby Quarry. It has dramatic sweeping veins that run through the slabs. The veins are typically a soft light green, that contrast with the nice white background of the slab. Olympian Danby is typically a very white marble with light soft veining. The veining will vary from block to block, but the slabs typically have medium to heavy veining. At Imagine Surfaces, we love a clean all-white kitchen, and white has been the most sought after kitchen style for years. Hello, Instagram #goals, right? Well, we are saying goodbye to the white kitchens of yesteryear and instead welcoming a new neutral to the kitchen. Country Living calls it "Neutral Kitchen 2.0" and says that this trend "is still understated, but (thankfully!) not cold, sterile, or cookie-cutter." White can still play, but soft neutrals and natural surfaces are the trademarks of the new neutral heart of the home.